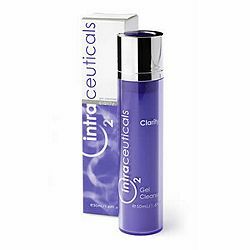 We have been reviewing some Intraceuticals products, so keep your eyes out for two more reviews- one on this ultra fun acne healing pen, and another on their treatment gel. They have a really fun line and we have enjoyed reviewing some of the funky products (you'll see what I mean by funky when Jessica reviews the acne treatment). What I have to bring to you today is a very basic cleanser. If you want to read the ultra specifics, check out this direct link to their website HERE. As I was exploring on their website, I noticed that they have several lines. The one we tried was the full Clarity line. There are three steps and each one comes in a normal formula and then one for sensitive skin. Super cool! A lightweight gel cleanser to thoroughly cleanse the skin and remove excess oil and impurities. The SLS free formula leaves the skin conditioned and primed to receive optimum benefits from Intraceuticals’ 3 Step Hyaluronic Layering. Apply to all areas of face twice daily, prior to hydration gel and moisture binding cream or as directed by your skin care professional. If irritation occurs, discontinue use. - Lather and leave on skin for 5 minutes for a deep cleanse and exfoliation. - Teen with acne prone skin and occasional oiliness due to adult acne prone skin. Pretty much every time I read a product description with Hyaluronic Acid in it, my heart skips a beat. I love that ingredient more than I can tell you for all the amazing thing it does for the skin. I love it because it is ultra moisturizing- and get this- can hold 100 times it's weight in water. So, love at first sight for me. I really love that aspect of this cleanser. Also, I love gel based cleansers SO much. Why? Because they don't seem to clog my pores and they get me really really clean. This cleanser was no exception. I do really love the way it lathers upon application, and easily rinses off leaving me with a clean face that's not tight or dry. I also like that this is an acne product and helps to relieve adult acne prone skin, and enlarged pores. It also says it will help congested pores from accumulated keratin build up. What on earth is that? I decided to read about it and discovered that keratin build up can come from allergies, and excessively dry skin among other things. Yikes! I might be at risk for that nastiness! Glad this cleanser can relieve me of it. In short, I really like this cleanser and have added it to my rotation. I am especially excited to see how this performs in the winter since I love to add more hyaluronic acid products to my rotation when it's cold and dry outside. I love Intraceuticals! I just received several items from the Rejuvenate line that i purchased on ebay a few days ago.There is some awesome deals on there, more than half off on some and sets of 2 for cheaper than 1 retails at! I'm totally hooked have a new favorite product.